Tegucigalpa is the capital of Honduras, Central America, and is located in a mountain basin at 3250 feet. The city airport, Toncontin International Airport (MHTG) , is famous for its spectacular aircraft operations due to the surrounding terrain and short runway. 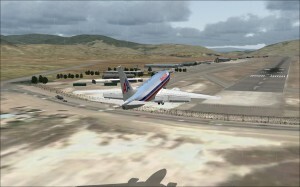 Read this article from Airliners.net about the airport. Toncontin has a single 6100 ft long runway with runway 02 having 5400 ft available for landing. The airport has VOR/DME approaches for runway 02/20 with a Minimum Descent Altitude of more than 2000 ft above airport elevation. One of the largest aircraft serving the airport is the Boeing 757. Toncontin is combined civil and military airport. The entire area east of the runway is reserved the military and hence the airspace is prohibited UNL-GND. Download airport charts (Spanish only).